The Time Eternal podcast is back with a new format and approach. 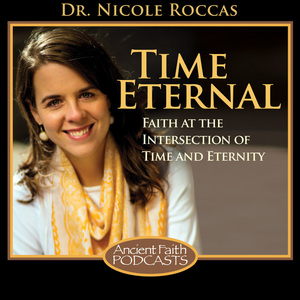 In this first episode, my husband and I walk the meditation trail at Antiochian Village and ponder this whole business of recovering eternity in the world of time. With this relaunched version of Time Eternal, one of the new things I’ll be doing is posting show notes with quotes, links, or images that pertain to each episode. You can always find them here on the blog within 24 hours after the episodes, or on the Ancient Faith page for each episode (look for the hyperlinked “Attachment” next to the title of each episode). I will try to share the new series with others. Still, I cannot believe it has been a whole (church) year since this post – thanks again!